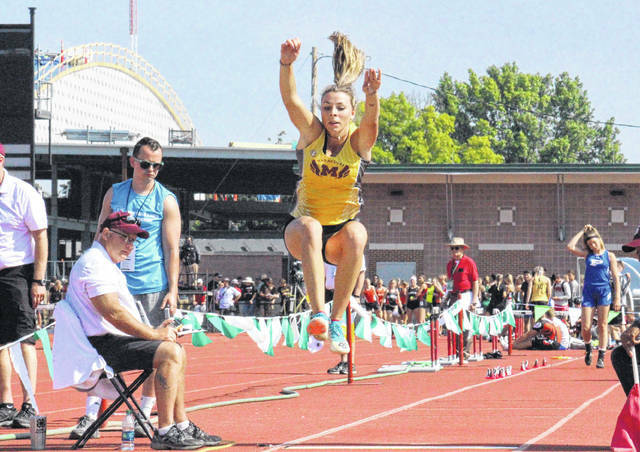 Meigs junior Kassidy Betzing places fourth in the OHSAA Division II long jump state final on Saturday at Jesse Owens Stadium in Columbus, Ohio. COLUMBUS, Ohio — Another leap in the journey for one, and the wrap to storied prep careers for two others. The final day of the OHSAA state track and field championships featured a trio of athletes from the Ohio Valley Publishing area, with junior Kassidy Betzing competing for Meigs, senior Jessica Cook running for Eastern, and senior Nathaniel Abbott representing River Valley. Betzing — competing in the Division II girls long jump for a third straight year — had the third longest jump, a distance of 17 feet, 5¾ inches, after three jumps, qualifying for the finals. With her second of three final round jumps, Betzing leaped 17 feet, 6¼inches, placing her fourth overall and giving the Lady Marauders five points in the team standings. Betzing was exactly four inches shy of the winning leap. Betzing entered the state meet with the fourth best regional mark of 17 feet, 5¾ inches. In her three-year prep career, Kassidy has stood on the podium four times in four different spots. As a sophomore, she was second in the long jump and part of the eighth-place 4x100m relay team, while she was seventh in the long jump as a freshman. The Lady Marauders were one of 11 teams tied for 37th with five points in the team standings. Beachwood won the Division II girls competition with 38, followed by Buchtel with 31 and Chagrin Falls with 30. A total of 75 teams scored in the girls Division II meet. Running for River Valley in the boys Division II 800m final, Abbott — a Marshall University signee — finished 16th out of 18 competitors with a time of 2:00.52. Abbott entered the meet with the 13th-best qualifying time of 1:57.15, and finished 7.3 seconds off of the pace on Saturday. Cuyahoga Valley Christian Academy won the Division II boys title with a score of 51, followed by Dunbar at 44 and Sheridan with 39. A total of 71 teams scored in the Division II boys competition. Representing Eastern in the girls 800m run, Cook — a Shawnee State University signee — placed 16th of 18 runners with a time of 2:25.99, 10.89 seconds off the pace. Cook — who entered with the 17th best qualifying time of 2:24.02 — was also 16th in the 800m run as a sophomore, while she placed 12th in the 1600m run, and 13th in the 4x800m relay as a freshman. Minster was the Division III girls champion with a score of 57, followed by Covington with 32 and Malvern with 30. East Canton was the Division III boys champion with a 64, 24 ahead of runner-up Smithville and 26 ahead of third place Worthington Christian. A total of 62 teams scored in the Division II girls competition, while 72 D-III boys teams scored. Three local athletes competed on Day 1 of the OHSAA championships, with Gallia Academy senior John Stout placing 14th in the Division II 200m dash, Eastern senior Tyler Davis finishing 15th in the Division III shot put, and EHS junior Noah Browning taking 16th in the Division III 400m dash. Visit www.baumspage.com for complete results of the OHSAA state championship meet.